CHICAGO (WLS) -- The Ñ Beat is an Emmy award-winning half-hour show that turns the spotlight on Chicago's vibrant Latino community! 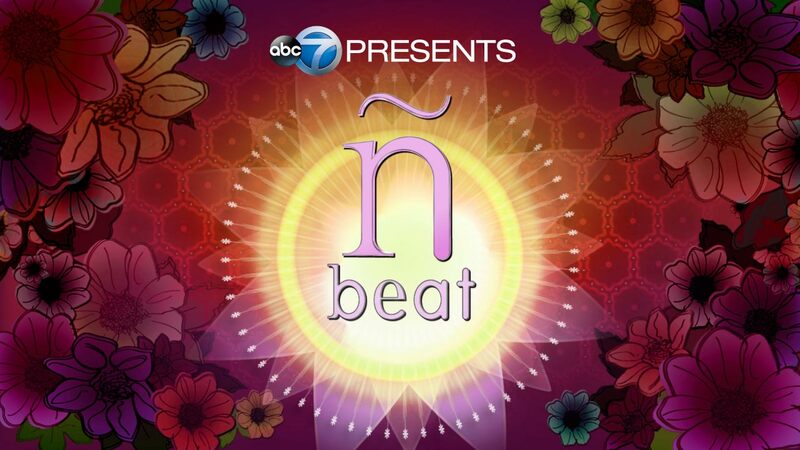 ABC7 Chicago brings you another episode of The Ñ Beat Saturday, March 24th at 6PM. Six months after Hurricane Maria roared through Puerto Rico, you'll find out how Chicago has rallied to support that island's storm-weary survivors.. including a talented artist and his family. Also, meet another Puerto Rican artist whose love for her Chicago neighborhood inspired her recent MCA exhibit. He gained fame on the reality cooking show, 'Top Chef'.. now, you'll meet the Mexican chef who is marking a milestone with his first Chicago restaurant and see how a Brazilian native is getting her pupils 'moving'..with her lively lessons straight from Rio's Carnival!! ABC7's Stacey Baca hosts the show from the Puerto Rican Cultural Center's new child development center... or 'Consuelo Lee Corretjer Centro Infantil'. Correspondents include Roz Varon, Tanja Babich, John Garcia, Michelle Gallardo, Rob Elgas and new to our Ñ Beat family, Mark Rivera! Refugees from Hurricane Maria made a new home in Chicago's Humboldt Park. Hurricane Maria stormed the shores of Puerto Rico last fall.... leaving a trail of destruction. It is the worst natural disaster in the history of that island and the recovery has been slow to happen. In the meantime, thousands of 'survivors' of the storm have fled. In fact, at least 2,500 have made their way to Chicago. The Puerto Rican Cultural Center is one of the key outposts for support as the evacuees look to start over. In fact, one former art professor in San Juan has made Chicago a 'second home' for his family largely, thanks to the PRCC. Richard Santiago is artist-in-residence for the PRCC's new child development center..or Consuelo Lee Corretjer Centro Infantil. Richard has moved his entire family to the Windy City... and is bringing his artwork to the walls that will liven up the child care center for years to come! Puerto Rican artist Edra Soto creates art inspired by her East Garfield Park home. Edra Soto is another talented artist who hails from Puerto Rico but now, Chicago is very much her home. Her neighborhood... East Garfield Park... is an important inspiration in her latest work. As Edra would walk her neighborhood with her two dogs, she picked up garbage... much of it happened to be old liquor bottles. Edra collected hundreds of them... cleaned them up... and turned them into a thought-provoking and inspiring exhibit at the Museum of Contemporary Art of Chicago. Iterations of 'Open 24 Hours' have gone on to be exhibited across the country. Along with her social activism through her art, Edra is on a mission to promote 'up and coming' Chicago artists. She and her husband have built a free-standing art gallery in their backyard, called 'The Franklin' and invite new artists to display their work there. The Franklin garnered buzz as one of the city's top new art galleries back in 2013. Chef Carlos Gaytan is the first Mexican chef to receive a Michelin star. You may know him as a reality TV personality... from his stint on Top Chef... but Chef Carlos Gaytan... is also the owner and executive Chef of Chicago's Mexique. The West Town restaurant is celebrating it's tenth year in 2018! Chef Carlos is the first Mexican Chef to have received a Michelin star for his work and he works tirelessly to help children with their education and just opened a new restaurant in Mexico called Ha. Dill Costa teaches Chicagoans to Brazilian Dance at the Old Town School of Music. Dill Costa is a dancer, singer and actress who hails from Rio de Janeiro. Chicago is her home now but she brings a big taste of her homeland to all of her enthusiastic pupils. Dill teaches Brazilian Dance at the Old Town School of Folk Music. Her students say there is no one better! She even takes some of them to Carnival in Rio every year. And on June 30, 2018 will star in her own show right here in Chicago. Ixhelt Gonzalez is the youngest player to make the US Women's National Wheelchair Basketball team. When Chicago's Ixhelt Gonzalez was born, she was confronting a disability but this 13 year-old is definitely -not- letting that 'hold her back'! She has achieved a -first- in the sports world....she recently became the youngest member of the US Women's National Wheelchair Basketball team! Along with keeping up with her work as an 8th Grader at Immaculate Conception School, she flies out to Colorado to train with the team at the Olympic Training Facility. The women are preparing for this summer's World Championships in Hamburg, Germany. While Gonzalez does not use a wheelchair in her daily life, she copes with a debilitating condition called femoral introversion, which causes her feet to turn inwards when she walks. She is still trying desperately to raise funds for both a new wheelchair she needs to compete and the funds needed for all of her travels. Anna Valencia uses her office to get Chicago youth engaged in politics. When Anna Valencia was a teen, she had the opportunity to work for a political campaign in downstate Illinois. Today, she is 'paying it forward' by introducing millennials to government, hoping it will spark an interest in them, just like it did for her. The Ñ Beat takes a closer look at how Valencia runs the City Clerk's office... and engages the city's youth all at the same time. We caught up with her as she invited a local Civics class to see how things operate at City Hall.